Sci-Fi Cinematic & TV Inspirations for Star Trek? Discussion in 'General Trek Discussion' started by Ensign Ricky, Mar 29, 2019. I'm trying to put together a personal guide, going through 1950s and early-60s Science Fiction TV and Movies, I just wanted to ask: What Sci-Fi movies and television shows inspired & influenced Gene Roddenberry to create our beloved Star Trek? There are two threads that touch upon this, and I thought I'd pool that information here. Now, it is common knowledge that The Forbidden Planet was a huge inspiration for Trek, depending on who you ask. I have also heard that Robinson Crusoe On Mars was also a possible inspiration as well. On the TV side of things, I have also heard and read that The Twilight Zone & The Outer Limits played a role, along with other Science-Ficiton anthology/theater shows. You could also add in the Flash Gordon & Buck Rogers serials from the 40s into the mix too. What other motion pictures and programs influenced Trek? I honestly think there's not much more non-literary sci-fi influences for the original series. I always thought Star Trek was influenced by books and short stories. Future Trek had a huge number of movie and show influences including 2001 for the first movie and Star Wars for the rest. There's the slimmest chance in the world that Doctor Who might have influenced some TOS, but no Americans saw it that early. There's no doubt in my mind that the animated series had some Doctor Who influence though. Roddenberry never much acknowledged it, but it's a very obvious influence. We know for a fact they screened it (there are memos to this effect). "The Cage" owes a lot to the premise (advanced civilization destroys itself with its own mental powers) and some of the production details (the transporter bears more than a passing resemblance to the DC stations on the C57-D and the Talosian arches look a bit like the Krell ones). There's definitely a lot of literary influence on Star Trek, beyond the contributions of noted prose authors like Sturgeon, Spinrad, Matheson, Bloch, Ellison, etc. A lot of Trek's core concepts originated in the SF pulps or paperbacks of earlier decades. The concept of "warp" propulsion goes back to John W. Campbell in about 1930, and terms like "subspace" and "tractor beam" also date to 1930s SF magazines like Astounding and Amazing Stories. The concept of antimatter as a power source also dates back to the '30s and '40s in prose, though initially under other names like "contraterrene." Federation-like organizations were portrayed in the works of writers like Anderson and Heinlein, and some of them were portrayed as having non-interference policies (though the term "Prime Directive" was coined for a different purpose in Jack Williamson's "...With Folded Hands," to refer to something like Asimov's First Law of Robotics). The general idea of humans spreading across the stars and building a benevolent empire or federation or the like owes a great deal to Astounding's editor John Campbell, although there was an ugly current of allegorical white/Western imperialism underlying it. The name "Vulcan" for an alien planet was originally proposed by Urbain Le Verrier for a hypothetical planet closer to the Sun than Mercury was, as a potential explanation for anomalies in Mercury's orbit. Einstein eventually explained those anomalies as a relativistic effect, discrediting the idea of Vulcan, but the name had caught on in SF and continued to be used for alien planets in a number of works even decades later. There's no doubt in my mind that the animated series had some Doctor Who influence though. Why in the world would you think that? It's very unlikely; while a few US stations carried Jon Pertwee episodes starting in 1972, most of the US didn't start to see the show until PBS stations started to carry it in 1978 and into the '80s. And there are no unique ideas. Different creators working in the same genre arrive at parallel ideas unintentionally all the time, because they're working in a shared pool of earlier ideas and tropes and because of convergent evolution. So similarity alone is never proof of deliberate borrowing. As you said yourself, you can't consider science fiction influences without considering the print literature. That's where everything begins. Film and TV science fiction is usually based on tropes that were established in the literature at least a couple of decades earlier before filtering out into the mass media. So if two contemporary TV series or films have similar ideas, it's highly likely they're both drawing on similar prior literary influences. Just as prose SF writers build on the influences that came before them. Doctor Who surely drew on H.G. Wells, and so does most every other time travel story if you trace its roots back far enough. Partly. Data was also partially based on Xon from the abortive Star Trek: Phase II TV revival that evolved into Star Trek: The Motion Picture. Similarly, Picard was based on Phase II's older, wiser Kirk, and Riker and Troi were based on Decker and Ilia. And the "Post-Atomic Horror" backstory from "Encounter at Farpoint" seems to have been recycled from Roddenberry's Genesis II/Planet Earth pilots. While we're at it, The Questor Tapes was Roddenberry's third stab at the Assignment: Earth premise, after the original, unfilmed 1966 half-hour pilot script and the backdoor-pilot TOS episode. He just substituted an alien-built android for an alien-bred superhuman. And Gary Seven always struck me as being influenced by Klaatu from The Day the Earth Stood Still. Although how an author recycled his own ideas is a different question from what other creations he was influenced by. I've always thought that "The Day the Earth Stood Still" is to "Assignment: Earth" as "Forbidden Planet" is to Star Trek. Meanwhile, "Requiem for Methuselah," in particular, seems to owe a lot to "Forbidden Planet": a remote world inhabited entirely by an unwelcoming older scientist, a beautiful ingenue who falls for the dashing ship captain, and a multipurpose robot servant. Granted, both "Forbidden" and "Requiem" are riffing on Shakespeare's "The Tempest," so it's possible that "Requiem" was inspired directly by "Tempest" rather than via "Forbidden." Possibly. Although Jerome Bixby based "Requiem" somewhat on his own The Man from Earth, a screenplay he began work on in the early 1960s (and Wikipedia says he conceived of it in 1946) even though he didn't complete it until 1998 on his deathbed (and it wasn't filmed and released until 2007). And he was inspired by Romanian and other myths about immortals. Bixby also based "Mirror, Mirror" on his 1953 story "One Way Street." "Requiem for Methuselah," seems highly similar to The Forbidden Planet to me. "The Man Trap" seems likely to have been influenced by A.E. van Vogt's "Black Destroyer" and/or "It, the Terror From Beyond Space" (1958), and "The Man Trap" and its possible sources seem like possible influences on Alien (1979). 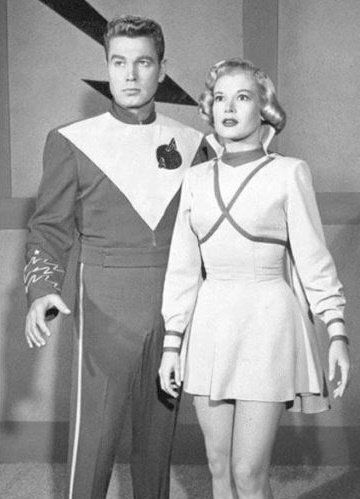 I have read on Wikipedia that the 1954 series Rocky Jones, Space Ranger was an early inspiration. ^Wikipedia is not always reliable. I suppose '50s kids' series like Rocky Jones and Space Patrol Tom Corbett, Space Cadet were influential because they were pretty much all there was in '50s SFTV, and they did sort of establish the template of organizations with names like "United Planets" and the heroic space officers who defended them; but to a large extent, they were (along with Irwin Allen's shows) what Star Trek was reacting against by doing SF as adult drama rather than children's adventure. ^Wikipedia is not always reliable. IDK, I'm already starting to see some similarities. That pic reminds me why, back in the day, I referred to TMP as “Space: 1999: The Motion Picture”. The bland costumes, monochromatic sets, languid pacing, and nonsensical “science” seemed more like “1999” than like the original “Trek”. Huh? 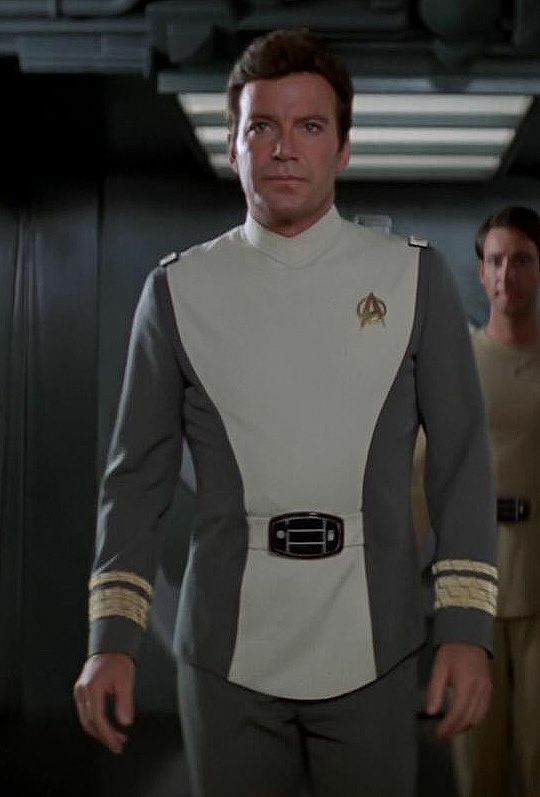 TMP was easily the least scientifically nonsensical Trek movie. It had JPL rocket scientist Jesco von Puttkamer, Isaac Asimov, and astronaut Rusty Schweickart as technical consultants, as opposed to the later movies that just made up random gibberish like Genesis and protomatter. It was, as far as I know, the first work of screen science fiction to use the term "wormhole," which at the time was a fairly obscure solution of General Relativity that even print science fiction did little with prior to Carl Sagan's Contact. And by the way, Space: 1999 looked great. Its technology and prop design was a lot more detailed and plausible than TOS's, and its Eagle spaceships were far cooler than Trek's boxy shuttlecraft (although both had the same problem of lacking airlocks and having interior and exterior proportions that didn't match). Two of my favorite science-fiction productions, TMP and Space:1999. Well, when I was 15 and 19, respectively, I was watching for very different reasons than now. These days, TMP is the one I watch the most. Upon release, it impelled me on a 2 1/2 year gafiation from Trekfandom. And as for nonsensical science, I present as evidence “82 au’s in diameter” and “it fell down a black hole and popped out at the other side of the galaxy” and “it amassed so much data it achieved consciousness itself.” Just because I can’t prove these couldn’t happen (because I can’t prove a negative) they don’t seem scientifically plausible. Which proves they knew what an AU is. That's more scientifically literate than most movies. What in the world is wrong with that? The idea that certain kinds of black holes could function effectively like wormholes has been implicit in the relativistic equations since they were first worked out in Einstein's day, and has been frequently used in hard science fiction. Alternatively it could've followed a closed timelike curve through the ergosphere of a black hole, which is pretty much the exact same thing as the slingshot effect from "Tomorrow is Yesterday." Again, what in the world is wrong with that? Intelligence arises from complexity. How is it implausible that an AI designed to learn and grow would be able to evolve intelligence? Isn't that what happened with the Doctor on Voyager, basically? Totally different. Astronomical units and black holes are real astrophysical things. A black hole as a spacetime bridge is a concept rooted in real theory, as is the idea of artificial consciousness. "The Genesis wave" and "protomatter" are just nonsense words based in nothing at all. Genesis wave and protomatter may be nonsense, but terraforming is a real concept. Also, I used to think wormholes were a purely Star Trek thing. When that movie Contact came out, I thought they stole wormholes from Star Trek. Building shoes is a real concept, but that doesn't make "The Shoemaker and the Elves" plausible. The concept's been around in physics since 1916, but it never seemed to get a lot of attention, since Einstein and Nathan Rosen then rediscovered it in 1935 and then John Wheeler did in 1957 (and he's the one who coined the "wormhole" name at that time). I guess physicists tended to dismiss it because the math showed it would be unstable. Fiction occasionally referenced black holes functioning as passages to other spaces and times, or referred to space warps and folds of various kinds that worked analogously to wormholes, but did surprisingly little with the specific concept of an Einstein-Rosen-style wormhole. So TMP's use of the term was pretty unusual. It was Carl Sagan's novel Contact in 1985 that turned wormholes into a big thing in theoretical physics and science fiction, because he asked physicist Kip Thorne to come up with a credible FTL drive for the novel, and Thorne figured out that wormholes could be made stable with some kind of "exotic matter" with properties like negative energy. (Which, okay, sounds a lot like "protomatter," but Thorne came up with the physics first and then put a name on it, so it's not just empty words.) Other prose SF started picking up on the concept very soon thereafter, and real theoretical physicists embraced Thorne's ideas and developed them further, finding new solutions for wormhole equations and other applications of exotic matter (like Miguel Alcubierre's "warp drive" metric devised in 1994). Still, as far as I know, TNG was the first screen SF production to mention wormholes by name (in "The Price" in 1989), with DS9 then making them a regular story element starting in '93. The idea then got picked up by other screen productions and franchises like Stargate, Sliders, Farscape, etc. There aren't really many ideas in science fiction that originated with Star Trek. It usually adopts ideas that have been around in science and SF for decades. I covered some of those antecedents in post #4. Warp drive, teleportation, ray guns, tractor beams, force fields, telepaths, humanoid aliens, godlike aliens, androids, holographic simulators, shapeshifters, you name it -- it's all been done before. Even planets named "Vulcan" and organizations named "star fleet" have been done before. Trek mainly deserves credit for coining new names for certain existing ideas, like "phaser," "photon torpedo," or "mind meld." I think that "A Taste of Armageddon" has, either coincidentally or by direct inspiration, important elements of The Day the Earth Stood Still also. The Enterprise is on a mission to stop an interplanetary war from affecting a whole area of space, and they threaten the locals with total destruction unless they make peace. J.T.B. and Galileo7 like this.